We make these out of old, used pushbikes. We can build a specialised Bike, specifically to your size and needs, we are significantly lower in price than most manufactures as we use common, readily available second-hand parts, and recycled steel. This means that any repairs or replacement parts needed in the future will be able to be done at your local bike shop and will be reasonably priced. Contact us to find out more. We hire bicycles of all descriptions including the Pedalmania bikes for special events, this can be with or without pilots. We have a huge stock of second hand bikes and bike bits, of all shapes and sizes, we also have a stack of old bikes in a shed out the back ready to be taken apart for parts. Contact us to quote for your replacement part. We are available at ay stage to manufacture bicycles and bicycle based vehicles, we operate on a first come first served basis so Contact us to start your project. Every bicycle/project we make is different, some are “traditional” some are very "untraditional" Contact us to start the process. We are happy to provide a written quote to make or remake a bike for you. Bring us two old bikes and we will make it into a Tandem. Bring us an old Bike and let us make a Recumbent to fit you. See one of our bikes you like, they are all for sale!!!! 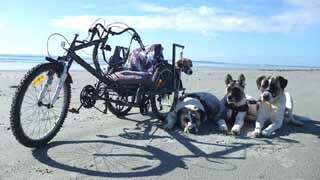 We also make Hand Cycles and Mobility aids. Contact us to quote on building you a bike.